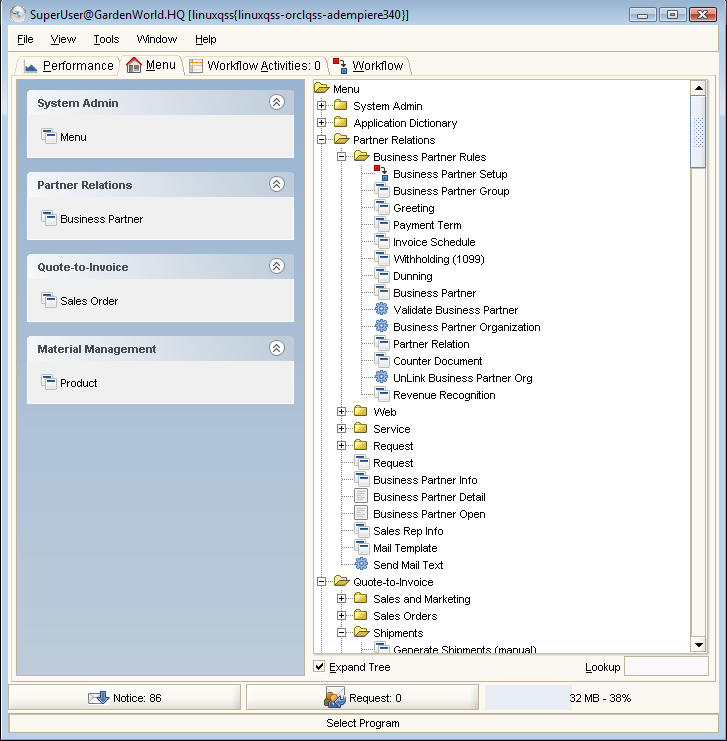 in second column the program type: Workbench, WorkFlow, Process, Report, Task, Window, Form, Menu. in third column the name of involved tables, and the name of reports and/or processes inside that option. This information is already a good technical help, i.e. if you want to know which window is used to maintain a table, you can find that table on this page and it will show you which is the corresponding maintenance window. Same if you want to find which window executes a process, you find it and it will show the window/process/report. Please don't modify the content, because this index is automatically generated by a script. Top Menu Views about those Views or important windows that are not stated in the main menu such as Account Info and Product Info. This page was last modified on 3 March 2009, at 15:47. This page has been accessed 20,836 times.